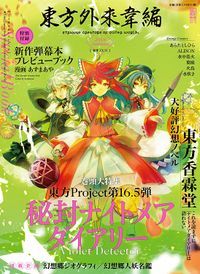 Touhou Gairai Ihen (Tomes of External Origins) ~ Strange Creators of Outer World (東方外來韋編 Strange Creators of Outer World) is an official Touhou Project magazine which began publication on September 30, 2015. 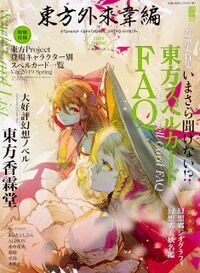 It is published by Kadokawa under its Dengeki Moeoh imprint with the full supervision and support of ZUN. 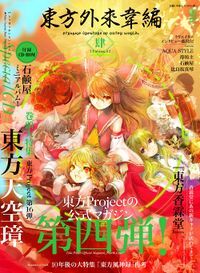 The magazine features interviews and introductions of doujin creators in all fields of Touhou fandom, newbie-friendly information on the Touhou universe, and a new serialization of Curiosities of Lotus Asia by ZUN. 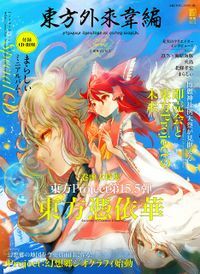 The inaugural issue also featured an in-depth interview about Legacy of Lunatic Kingdom, an interview about Urban Legend in Limbo with Twilight Frontier's Unabara Iruka, a Play, Doujin! interview with its game developers, and a music arrangement CD. 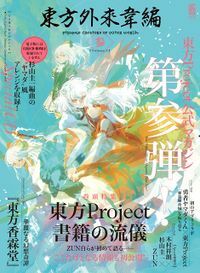 Strange Creators of Outer World was first announced via Twitter by synno_takana, a fan who spotted press materials at Comiket 88. An official website was soon revealed. 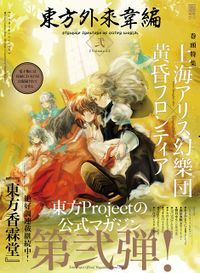 A preview of the first issue was released on September 24.
pg. 004-009: "Touhou Kanjuden ~ Legacy of Lunatic Kingdom." pg. 014-019: "Touhou Shinpiroku ~ Urban Legend in Limbo." pg. 022: A look at "Hero Yamada-kun"
Strange Creators of Outer World. 2018 Spring! Strange Creators of Outer World. 2018 Autumn! pg. 040-045: Touhou Kourindou ~ Curiosities of Lotus Asia. 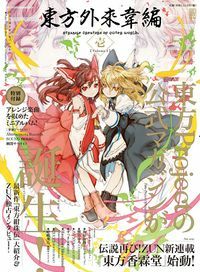 : Chapter 33: There Are Three Sumireko Usami! Strange Creators of Outer World. 2019 Spring! ↑ According to research, the spell card lists in this book contain more than 100 typos and other mistakes. This page was last edited on 13 April 2019, at 23:34.